TREKLAND: Happy birthday, De—94 and still so young! Happy birthday, De—94 and still so young! 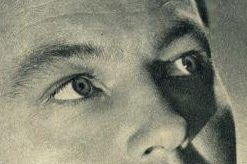 As is our habit over the years here at Trekland, we always mark the birthday of my favorite of them all, DeForest Kelley, and share some of our stack of De non-Trek images. 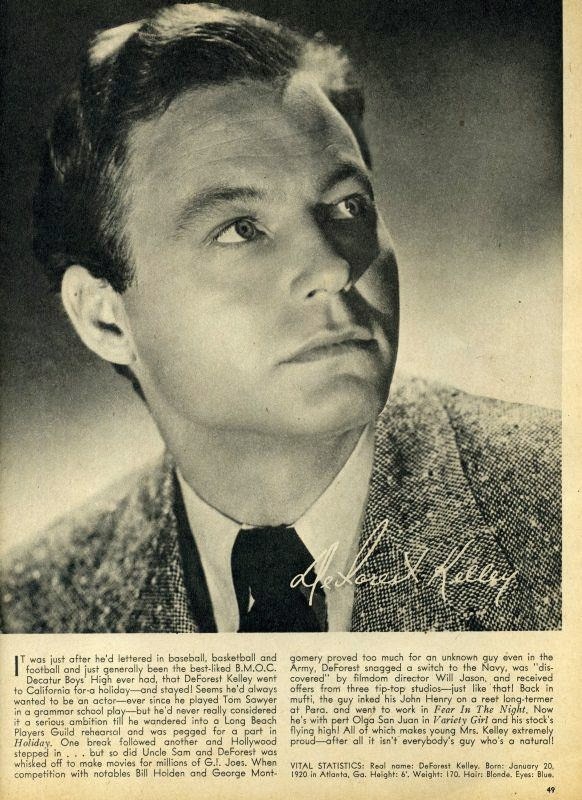 And this year, a twist: A full-page spotlight from, as you can see, a 1948 Hollywood movie star fan magazine—around the time of Variety Girl and just after his debut in Fear in the Night. (And I bet that life lifelong friend, the late great A.C. Lyles, help cobble the text together for the mag in his guise as a Paramount publicist.) Note that even here, they don't include his first name "Jackson" before his other two when listing his "real name." As if it was possible to up my feelings any more, you all know the past year has put me into an even closer relationship with De and his legacy by twice playing McCoy for Star Trek Continues, and the study actually gave me an appreciation for the darker sides of both actor and his role that I never considered as a fan. Just know that even though I've stepped back from the role now, I'll never step back from my appreciation of his understated performance legacy, the real-world path that De and McCoy both climbed in Star Trek, and the effect they had in getting me mixed up in this crazy franchise. He sure knew how to play McCoy and I will always love that character. I was surprised to see how much he and Shatner look alike in these younger photos of them. May just be partly to the style of photography.